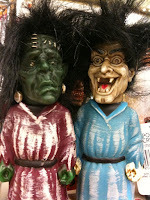 During the month of October I roam the streets and hit nearly every store that might be selling Halloween items. I am a super consumer this time of year buying all sorts of things (junk) that I won't use now, but think that someday I may use, so I buy it (sometimes I do use the things I buy, but my non-Halloweenie house keeps me from going hog wild like I'd like to...a post for another day). Usually on the 30th and 31st I make my final rounds to see what might be on sale and then on November 1st you'll find me doing the same - shopping the 50% off sales at stores. In recent years I've noticed that places are pulling their Halloween wares early. Heck, in mid-October I was seeing Christmas decorations for sale at some places. 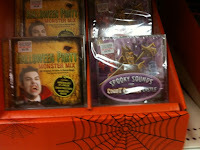 Years ago I attempted to get my Halloween CDs into stores and mounted a full assault on the retail industry. I thought that with the Pumpkinland series and Rain Station's DARK RIDE that I had a pretty good chance at getting at least something put into stores. I haunted Spencer's Gifts (Spirit Halloween stores is a division of Spencer's), Target, Wal-Mart, Party City, Party America and every other specialty store that carries Halloween CDs. Yet, I was not ever able to penetrate their wall. I knew that if I could at least get them to listen to the discs that maybe I could get 'em in the stores. It isn't easy when you're competing against Drew's Famous Party Music (here) ( One year I submitted music to Turn Up The Music (the home of Drew's Famous Party Music), but again, nothing), Midnight Syndicate (who are friends of mine) and various other lesser known or unknown vendors who are pumping out sheer garbage on CD. The guys of Midnight Syndicate do an exceptional job of marketing their music and I have complete and utter respect for them not only as businessmen, but as musicians. Their gothic brand of music works well in haunts, in stores or for TV broadcasts. Nox Arcana came along (same vein as Midnight Syndicate) and their CDs are carried by Spirit as well. Joseph Vargo (of Nox Arcana) at one time worked with the Midnight Syndicate guys so you can imagine that their are some similarities to what they're doing. 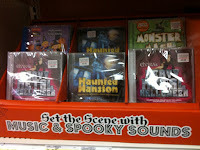 I've sold tons of my CDs online and have heard from folks saying that they're glad they found my style of haunt music. Much like mainstream (or non-mainstream) music there are many types of discs available to suit all tastes, but with Halloween music the stores are limiting what the public can purchase by assuming what YOU the consumer might enjoy. There's a lot out there and I just wish that some of my discs and the discs of some of my Halloween music friends could make it into party stores so that we could share our music with a larger audience. For now, you folks reading this blog and a few thousand or so others know about us. If anyone reading this knows someone who works as a buyer for storea that sell Halloween CDs, please drop me a line.